The National Trust’s S.H. 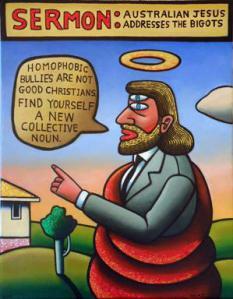 Ervin Gallery in Sydney had a survey exhibition The Art of Chris O’Doherty aka Reg Mombassa. Musician and artist O’Doherty also works as Reg Mombassa. His art is sold by Watters Gallery where he has had a number of sell-out shows since 1975. Sermon (2005) acrylic, glitters on canvas 90 x 70cm. Mombassa is known for his funky designs for the Mambo brand, blending humour, music themes and social criticism on religion, the environment and popular culture. 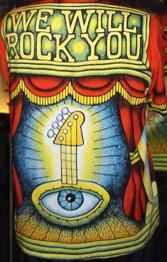 His designs gave Mambo overnight cult status, establishing the artist and the label internationally. 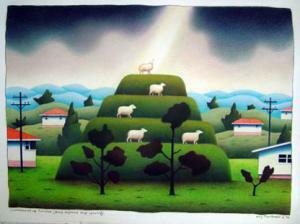 Commemorative Tumulus (2005) colour pencil, charcoal on paper 50.5 x 71.5cm. 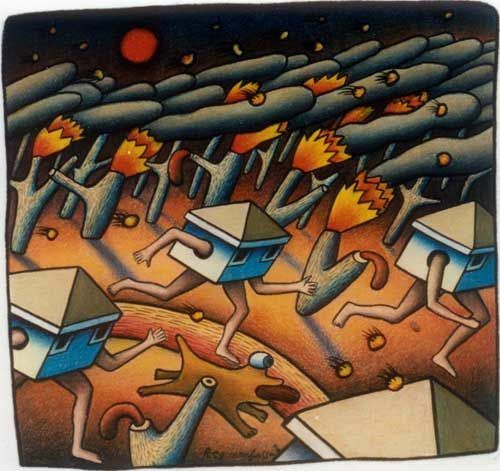 This 1998 work, Fire with fleeing houses (charcoal pencil on paper 32x28cm) encaptures the bushfire threat faced every summer.